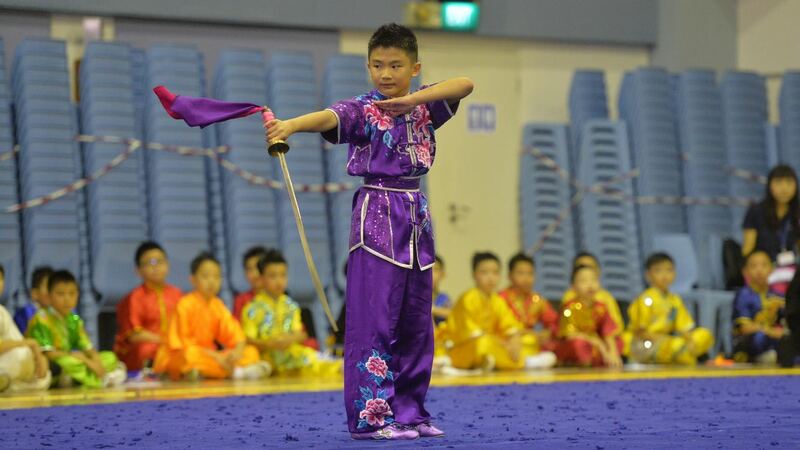 Day Three of the 13th National Primary Schools Wushu Championship 2017 can be touted the day of Taijijian because all the Taijijian categories were competed for and it made up 80% of the days’ programme. 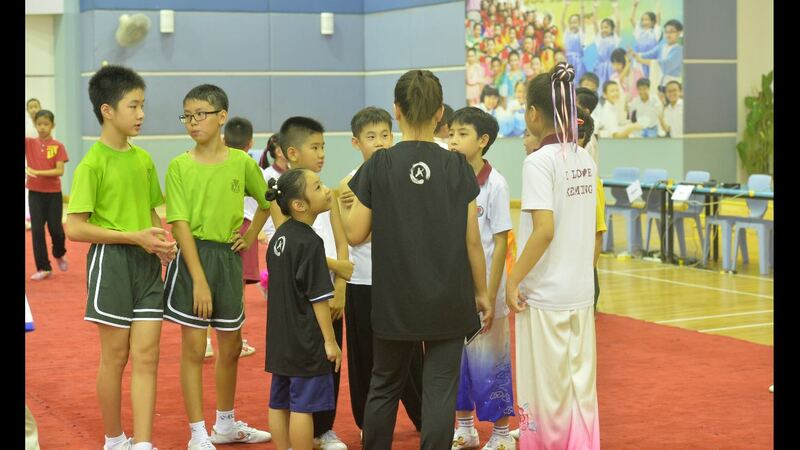 The other 20% went to the 4-Duan Broadsword event for the junior boys and girls. For Xuan Sports Wushu, we had athletes competing in all ten events making it a day of non-stop action for our cheer team. As twenty-seven of our athletes took their turns on the carpet, our cheer leaders cheered their hearts out and we are happy that their effort did not go to waste. 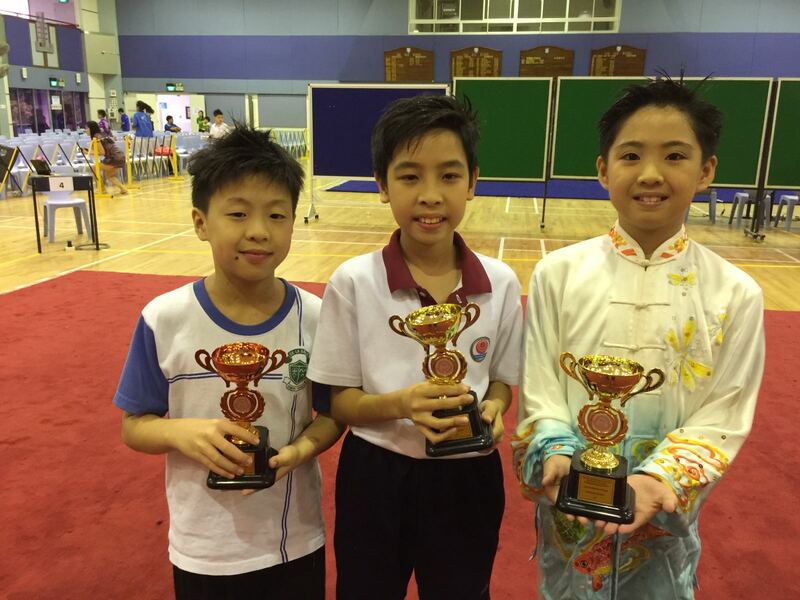 The days started with the 4-Duan Broadsword for the junior boys, which saw seventy-four competitors for the title. This is by far, the event in the entire championship with the most number of competitors. Kudos to the judges indeed, for having to live through this ‘ordeal’. Xuan Sports athletes Truman Chia (in the second photograph from the top) and Douglas Leow (above) made us really proud by emerging as the silver and bronze medallists for the event! 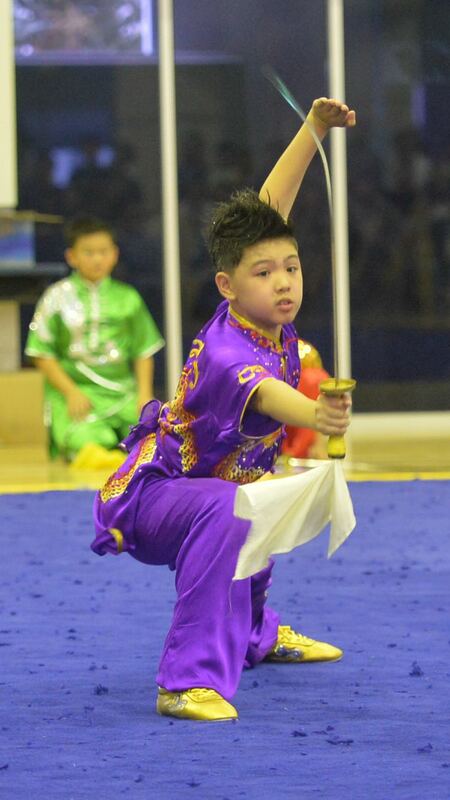 Truman narrowly missed the gold medal by 0.02 points, which is a big achievement for him because just a few months back, he had performed an incomplete routine for the same event in the 2016 National Wushu Championship. We are indeed happy that Truman is reaping the fruits of his effort in training. He has exemplified the true fighting spirit of Xuan Sports. 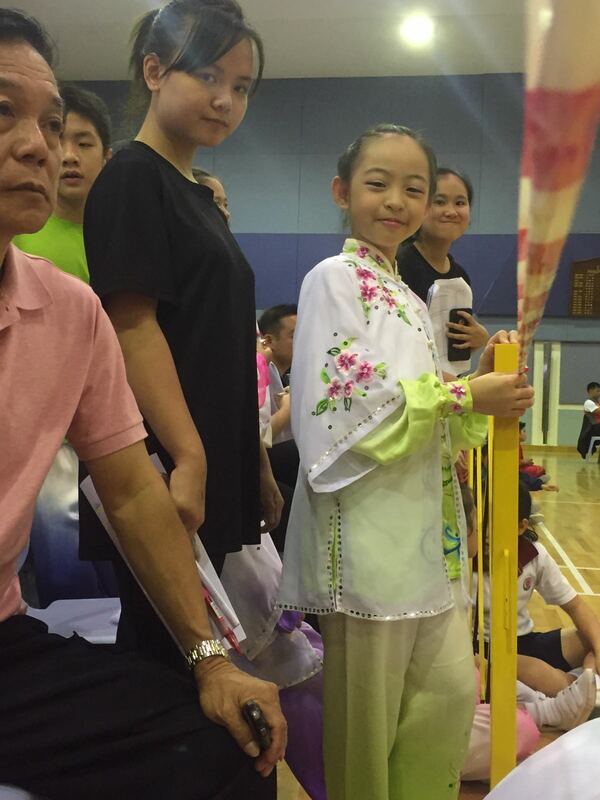 Interestingly, we also clinched the silver medal for the 4-Duan broadsword event for the junior girls through Vanessa Yan from Keming Primary School. This feisty girl has also improved in this event as she was in the 6th position last year. Well done, Vanessa. Over at Court B, where grace and slow but intense actions occurred, we are very pleased with our athletes’ performance in all the Taijijian events. First-time gold medallist in the junior boys 32-Style Taijijian, Isaac Wong from Keming Primary school, was ecstatic over his win. He was seen beaming with smiles from ear-to-ear for the rest of the day after his event. The senior boys 32-Style Taijijian also saw a couple of medals for us, namely, gold from Zephyr Wong from Catholic High School and a fourth placing from Favian Chong of Mee Toh School. Favian is also a first-time medallist in this event. Their female counterparts also mirrored their achievements and delivered two medals, namely, a gold from Lee Qin Yuan and a fourth-place medal from Chen Shaoyun. The two girls are both from Keming Primary School. The longer 42-Style Taijijian routine followed and Xuan Sports Wushu did well by snatching three out of the four available gold medals! In the senior boys’ category, Joshua Wong did us proud by taking the gold and Antonio Chee from Mee Toh Primary School took the fourth-place medal. For Antonio, this is indeed a motivation for him as it was his debut performance in a full-fledged competition. Our junior girls also did not disappoint as they grabbed the top two position in their category. Chloe Neo, seasoned Xuan Sports athlete, and Goh Wen Xi, won the gold and silver respectively. 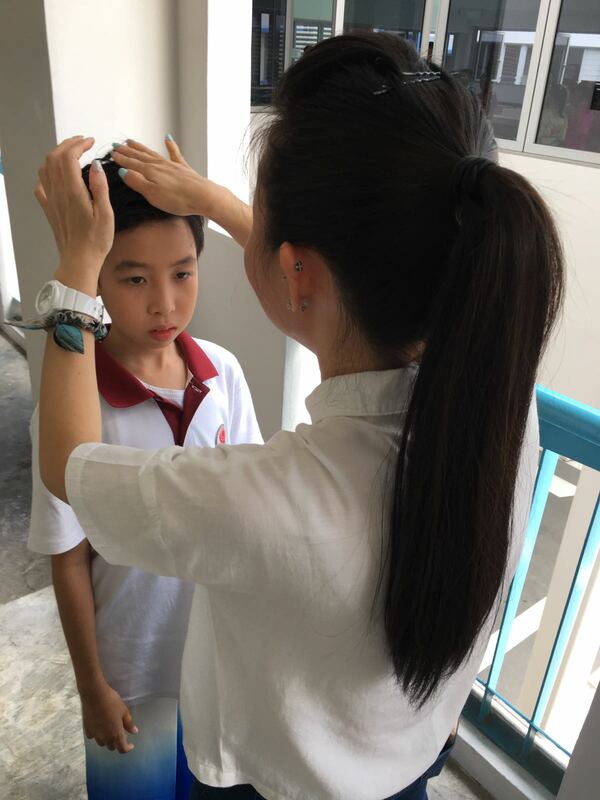 Our final gold medal came into Clement Gwee’s hands as he aced his performance in the senior boys’ Taijijian event, being the sole athlete who scored over 8 points. Adding to our total medal tally is Chen Shaohan, who managed to squeeze a fourth-place medal in the last event of the day. 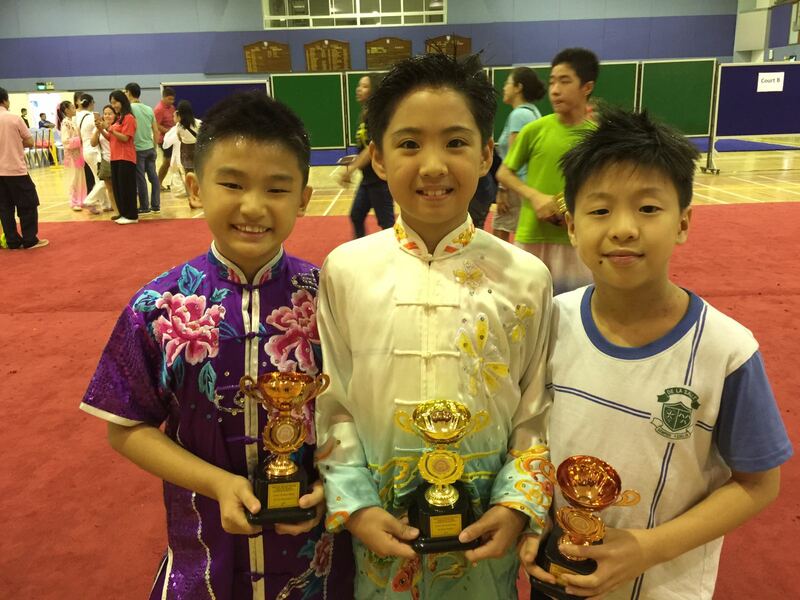 All in all, we are proud of all our athletes and special thanks to our Taiji coaches – Coach Jennee and Coach Liu Juan – for having worked so hard to achieve the fantastic results in all Taiji events. Once again, watch this space for more updates from the 13th National Primary Schools Wushu Championship 2017.